"Reporters don't like being interviewed." That's from an e-mail John Sherwood sent me on 8/26/06. I'd asked him if I could ask him questions about his role in landing Jerry Siegel and Joe Shuster, co-creators of Superman, a settlement for life in 1975. If you've read Men of Tomorrow recently, John's name may seem familiar, but he's been on my radar since long before that. While good man Phil Yeh was the first journalist to pick up on Jerry's press release and write about the sad state of Siegel and Shuster, John was the journalist who broke the story on a national level. 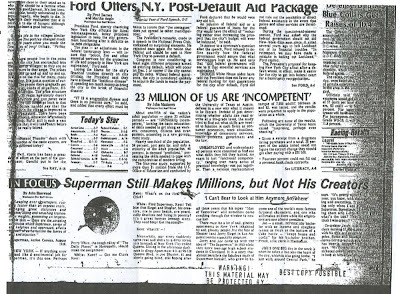 I learned of John's article—and later learned it was the first in a series of articles—when, circa 1988, I read an essay on the origin of Superman written by Dennis Dooley published in a book called Superman at Fifty. John's newspaper was the now-defunct Washington Star. After John's articles, other papers (including the Washington Post) began to cover the story, too. I thought that finding those articles would be easy compared to finding John himself. Googling his name alone would, of course, produce hundreds of possibilities. The Star ceased publication in 1981 so I didn't think there'd be much trace of it online. However, I Googled his name and the name of the paper together, and a bio of him came up. He'd written a book (about Maryland) and edited a magazine (about sailing), so I contacted the publishers of both. Someone at the book publishing company gave me his number and I called him. I gushed that I consider him as important to the Superman story as two high-profile names who did selfless work on Siegel and Shuster's behalf, artists Neal Adams and Jerry Robinson. John was predictably humble though I tried to talk him out of that. For those not familiar with your link to Siegel and Shuster, could you please give the capsule summary? Were you a Superman fan before you wrote your Siegel and Shuster articles? I read comics as a kid and especially loved the crooked “S” on S’s long blue underwear. I was a fan of Captain Marvel, too. I liked to draw and would unmask heroes such as The Phantom and The Spirit and anyone else wearing an eye mask by simply copying the face and leaving out the mask. Then I would look at how the artist drew eyes and simply sketch those in, a simple task. And, of course, I wore a cape and thought I could fly with it. Do you remember your reaction upon first reading Jerry Siegel's long press release? Did you know no other paper had yet covered it? I didn’t have a clue if any other paper covered the story. Was your editor immediately keen on running the stories? My editor immediately jumped on the idea. In those long-ago days at The Washington Star (1962-1980) I always came up with my own ideas because in that way I was assured of doing what I wanted to do. The editors kind of let me roam and do what I wanted to do. I also wrote about The Spirit for The Star and covered the artist doing the last strip of Joe Palooka. I was a great fan of radio, too. Were there any details which your editor did not want to include? My editors let me alone and never changed my copy, although they may have asked a few questions. What was the public's reaction to your articles? The public, as far as I was concerned, never reacted much to anything although there may have been a couple letters to editors re: Superman story. Did you hear from DC Comics? Never heard from DC Comics, except when I got a press release announcing the (meager) pensions. Big hearts, those corporate types. Has anyone else ever contacted you to ask about your Siegel and Shuster work? No, no one else I can recall. It was a long time ago. What was your proudest moment with regards to your Siegel and Shuster work? Having the story splashed on the front page (bottom) and, more importantly, Siegel and Shuster getting recognized with a pension. I am happy I was of help to “the boys.” It is a great human interest story to begin with. How did Jerry and Joe respond to you and your articles about them? I used to receive a Christmas card every year from Joe for a long time; nothing from Siegel, as I recall. Are you a Superman fan today? Not really. I follow Doonesbury, but not for the art. Few comic artists were as good as Hal Foster and The Spirit’s gifted creator, who also had a great sense of humor. 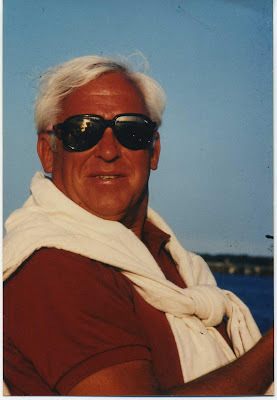 In 1997 I became a senior staff writer at Soundings, a national recreational boating magazine published out of Essex, Connecticut. 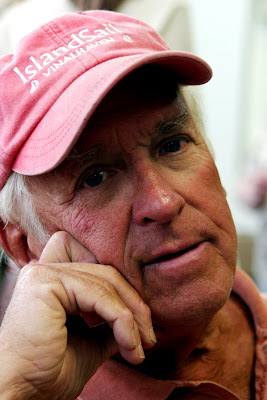 I semi-retired in 2005 but continue to write a monthly, full-page personal column about sailing and my sailing experiences entitled "Bay Tripper." I have never missed a column in all those years. I sail and single-hand the Chesapeake Bay out of Annapolis, where I keep my classic fiberglass sailboat—a Sparkman & Stephens-designed Sailmaster 22 built in Holland in 1962. Named Erewhon. I am a widower and have lived in the same house for 44 years. I have three sons and one grandchild.